This has been a very, very slow week for book reading for me. I usually finish at least one book a week and since I posted what I was reading last week, I have not finished any books or started any new ones. So this will be a short post — but as usual, I still look forward to your recommendations because a girl can never read too much or have too many books on her to-be-read list! 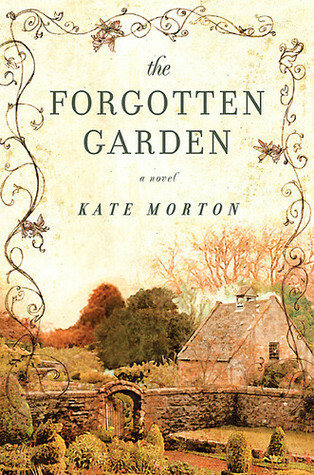 From what I have gathered so far, The Forgotten Garden by Kate Morton is a historical mystery of a young girl sent to the US on a boat many, many years ago. Her story unfolds after her death at the inquiry of her granddaughter. That’s about as far as I’ve gotten but I’m enjoying it so far… if only I could enjoy watching tv less this week! What are you reading? Share with me in the comments, and don’t forget to share any other recommendations you have for me as well! I just finished Howard’s End. Now I want to see the movie! I am reading The Year of Biblical Womanhood by Rachel Held Evans. I’m a 3rd in and I’m not sure what I think of it. I have a dear friend who is reading it as well and she made an interesting comment about how it isn’t a bad book, but that Rachel has a different view of biblical womanhood than we do and it really colors her perspective. It was very interesting. If you want to watch the movie, I assumed you liked Howard’s End? I’ve never read any Forster and I feel like I should… must expand my reading! Broaden my horizons! This IS her best book! Your friends did not lie to you! I reviewed it, as well, and I LOVED this one! I’ll check out your review once I’m done (I am always worried about spoilers). By the way, I love your blog. I’m kind of tapped out on adding new blogs to my reader but yours is going in there as soon as I am done posting this comment! Oooh, thanks! I feel so special! ‘m usually pretty good about not posting spoilers (and if I do it’s always REALLY obvious LONG before it happens), but I completely understand! I usually skim reviews of books that I know I want to read!